South African President Cyril Ramaphosa has said that the technical recession announced inside the country and internationally is only a transitional phase. The ruling African National Congress (ANC) leader and head-of-state will be standing for elections in less than one year. Reports of an economic slump are being utilized by the opposition to cast aspersions on the continent’s oldest liberation movement turned political party. 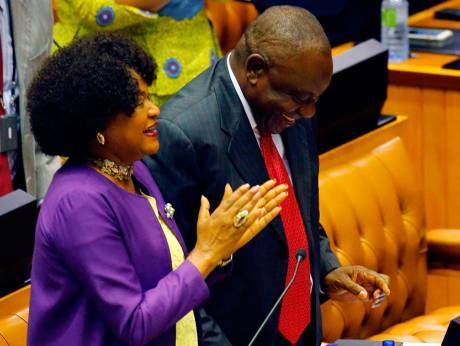 Ramaphosa came into office from the deputy presidency with the resignation of former ANC leader and President Jacob Zuma in February. Both the domestic opposition to Zuma in and outside the ruling party, along with international interests, attributed the slump in economic performance prior to early 2018 to the atmosphere generated by allegations of corruption against the former president. With the assumption of the presidency by Ramaphosa the leading economic indicators improved. Nonetheless, Ramaphohsa, a co-founder and former Secretary General of the National Union of Mineworkers (NUM), a leading affiliate of the Congress of South African Trade Unions (COSATU), sought to create an image that the political situation was stabilized and ripe for foreign investment. Ramaphosa knew that he had to unite the ANC internally and reinforce the strained relations between the ruling party and its allies within COSATU, the South African Communist Party (SACP) and the South African National Civic Organizations (SANCO). A resolution passed jointly from the EFF and the ANC by the National Assembly in late February called for the seizure of European settler-owned land absent of compensation. White farmers became nervous about the prospects of losing their ill-gotten wealth. This is obviously a key element in the recessionary spiral which is dominating the political landscape. Stats SA reported on September 4 that there was -0.7% negative growth in the second quarter of 2018. In addition, a revised assessment of performance in the first quarter was placed at a 2.7% contraction. A recession under capitalism is declared when there is two consecutive quarters of negative growth within the national economy. Other aspects of the malaise are manifested through the more than 27% official unemployment rate in South Africa. In the agricultural industry production fell by 29.2% in the second quarter right after an even larger drop of 33.6 in the first quarter. The causes behind this decline is said to be resulting from crop failures due to drought in the Western Cape and a hailstorm in Mpumalanga. 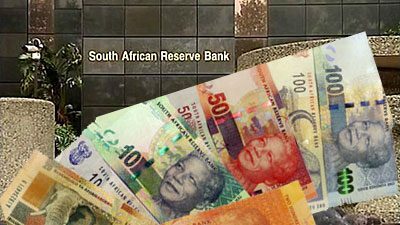 On September 5 the value of the South African rand also went down with the realization of a renewed recession, said to be the first one since 2009. However, and surprising to many, there was a slight rebound by the following day with one rand being equal to $0.065 in United States dollars as financial publications said that the South African currency was too undervalued. The country became a key player in the supply of strategic minerals and other natural resources during the late 19th and 20th centuries. Even today there are some of the world’s largest reserves of gold, platinum, iron ore and coal in South Africa. However, within a national context, mining constitutes less than 7% of the economic output down from 21% during the 1970s. Mine owners point to lower prices and rising production costs for the problems within the industry. Since the 1990s, the economy has been dominated by the tertiary sector including wholesale and retail trade, tourism and communications, constituting 65% of the Gross Domestic Product (GDP). Stats SA reveals that 20% of the economy is held by the financial sector. It is the financial sector as well which is facing significant challenges. One firm which analyzes the banking industry explained that in recent years there has been decline in performance which has clearly contributed to the economic crisis. Overall since 1994 when the ANC came to power, the overwhelmingly majority African population controls only a small portion of the economy. As it relates to the Johannesburg Stock Exchange (JSE) in 2017, only 3% of shares were owned by the indigenous people. 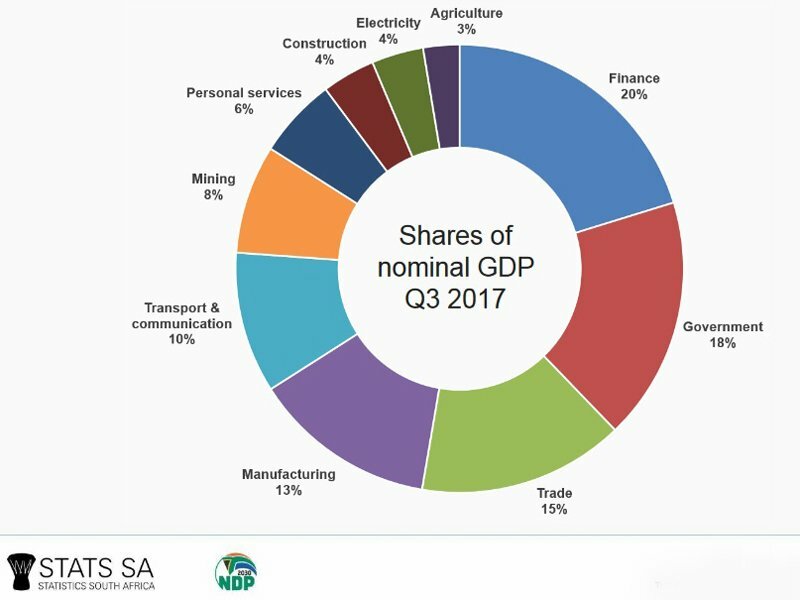 South African economy by proportion of sectors in 2017. Land ownership which was a key demand within the national liberation struggle has fallen far below of what is needed and desired. White-controlled mining firms, factories and agro-business enterprises represent the bulk of land usage. At the time of the end of apartheid 80% of the land was in the hands of the European settlers. Since 1994 land reform has been at a snail’s pace with the most optimistic estimates of some 10% being transferred to people within the African majority. The debate surrounding land reform is clearly a precipitating factor in the current economic crisis gripping South Africa. Imperialist states such as the U.S. have expresses concern over the redistribution of commercial farms. Republican President Donald Trump stated during August that he was directing Secretary of State Mike Pompeo to investigate the plight of white farmers as it relates to the violence directed against them and the impact on their status if the constitution is amended to nationalize the land without compensation. South African political officials responded expeditiously by countering the tone of Trump’s comments emphasizing the right of self-determination and sovereignty of the country. This does not, however, shield South Africa from possible sanctions and other forms of intervention into their internal affairs by the West operating in conjunction with the white-dominated ruling class inside the country. The lessons of neighboring Zimbabwe since 2000 remain vivid when the ruling ZANU-PF party passed legislation legalizing the expropriation of over 50% of farms controlled by the British settlers who had taken the land as part of the 19th century colonial process. Draconian sanctions, the creation and financial backing of pro-Western opposition groupings, along with an intensive destabilization program through the corporate media and an aggressive diplomatic offensive could easily be enacted against the ANC government in South Africa. Despite these proclamations by the president, the African masses of workers, farmers, rural proletarians and youth cannot move forward without radical economic transformation. The ANC and its allies must rely on the African majority to maintain its political authority in the event of a worsening economic crisis engendered by the crisis in capitalist production and exchange coupled with the desire to maintain the status quo.